NuScale Power has signed a memorandum of understanding (MOU) with Romania’s Societatea Nationala Nuclearelectrica (SNN) for exchange of business and technical information on NuScale’s innovative nuclearreactor technology. The goal of the agreement is to evaluate the development, licensing and construction of a NuScale SMR in Romania. SNN is the owner/operator of Romania’s Cernavoda nuclear plant. “With many years of experience in nuclear power, SNN understands the unique energy needs of Romania,” said NuScale Power CEO John Hopkins. Nuclear power currently provides 20% of domestic energy in the country. US Secretary of Energy Rick Perry applauded the agreement to evaluate how SMR technology could be used in Romania. “The Department of Energy (DOE) has been working to support many innovative approaches to power generation, including this ground-breaking technology. We are enthusiastic about the possibilities for the future and being on the cutting edge of nuclear generation technology,” he said. 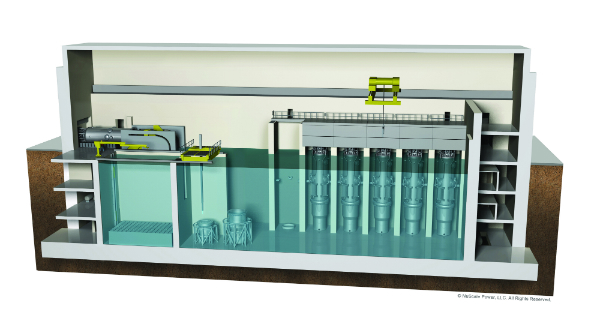 NuScale’s technology is the world’s first and only SMR to undergo design certification review by the US Nuclear Regulatory Commission (NRC), which is scheduled to complete its review in September 2020. NuScale has also signed MOUs to explore the deployment of its SMR in Canada and Jordan. NuScale's self-contained NuScale Power Module has a gross capacity of 200MWt or 60MWe. The scalable design can be used in power plants comprising up to 12 modules. In the USA, Utah Associated Municipal Power Systems is planning the development of a 12-module plant at the Idaho National Laboratory, with deployment expected in the mid-2020s.